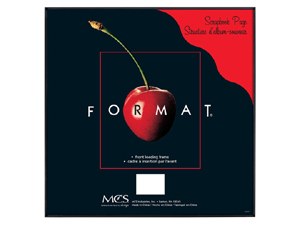 This popular square format 8x8 picture frame features a thin rail to minimize photo distration. Great for Instagram pictures.Comes ready for wall mounting. Minimize distractions by choosing a thin frame for your best photographs. The 8" x 8" MCS Format Frame with Glass Front is designed to display your pictures without taking away from them. The frame features a thin plastic edge and a clear glass front which pops out from the front of the frame for easy loading. This design is ideal for digital photos and can be used either horizontally or vertically. The frame measures just 9/16" thick making it ideal for hallways, galleries, waiting rooms and more. The back is flat and comes ready for wall mounting. The snap-in easel can be used for tabletop display or removed for a thinner profile when hung on the wall. The black plastic MCS Format Frame is ideal for Instagram photos, casual snapshots and more. The easy pop-out front makes changing out pictures a breeze. Due to the space limitations of the format frame, this design can only accept thin paper mats, but it is ideal for images printed at home. Frames are sold individually, but volume pricing is available for bulk orders of six or more frames.